There’s always something to talk about. Whether it be the latest food allergy or the latest electronic device or whatever seems to be trending, forming a dialogue may lead two complete strangers together for a single moment. In Kate Robin’s babble-fest I See You, two strangers are brought together by chance as they search for the missing part of their incomplete life. In I See You, two individuals, Nina and Jesse, are individually married with children, and after a chance meeting, end up finding a bound within one another. After two separate incidences bring them closer, they soon discover that there temporary bond is just that. Robin’s two hander did the inevitable. She made two strangers into eventual romantic interests. Though the outcome may not have been inevitable, it was possible you may have already zoned out on the unappealing duo. Robin’s script felt like a soapbox ventfest of hot button topics more than its intended intellectual piece about human interaction. This unfortunately caused a disconnect between Danielle Slavick and Stephen Barker Turner as they seemed to be talking at each other. Danielle Slavick and Stephen Barker Turner as Nina and Jesse took Robin’s characters and put a unique spin on them. Slavick and Turner had two approaches to their characters. Slavick's fast talking Nina felt quite sitcomy, almost as if she entered a Hollywood romcom while Turner's Jesse took a more dramatic approach. While both were equally interesting choices, they just were not cohesive. Though the point of the piece may have been that these two individuals were not on the same page, theatrically, something was severely lacking. Director Jim Simpson took the colloquial script and brought a surrealistic and theatrical approach to the world. While it was much more engaging than it would have been with a realistic set, the space was too vast for an intimate conversation. The negative space that was created forced an imbalance losing all intimacy. The set designed by Kyle Chepulis felt unfinished. By keeping the theater's walls in the playing space, it created a feeling as if something was missing. The turntable idea was clever but the transitions Simpson staged were unbearably long winded. Costume designer Claudia Brown took made some interesting choices when clothing the two characters. While Jesse’s costumes were simple and believable, Nina’s wardrobe had everything. Nina's costumes ranged from an initial homely look to boho hipster. As crazy as it sounds, the lack of cohesion of the character’s wardrobe was almost fitting to the overall lack of cohesion within the production. The one shining aspect of I See You was the lighting design by Brian Aldous. Aldous used the blankness of the world and gave it a beautiful color pop, especially along the back curtain. Imagine what the space would have looked like had the walls been white. Regardless of the odd location, the laser room scene was one of the most stunning visual moments of the night. With so much dialogue and very little action, I See You was a bit of a miss. 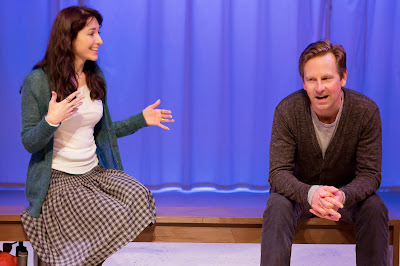 When you have a play with two characters, neither of which you want to root for, a ninety minute two hander can feel like an epic three-hour saga.